Creating and using "Group Switches"
One of powerful things Invisible: Controller enables is the quick and easy creation of virtual "group switches." 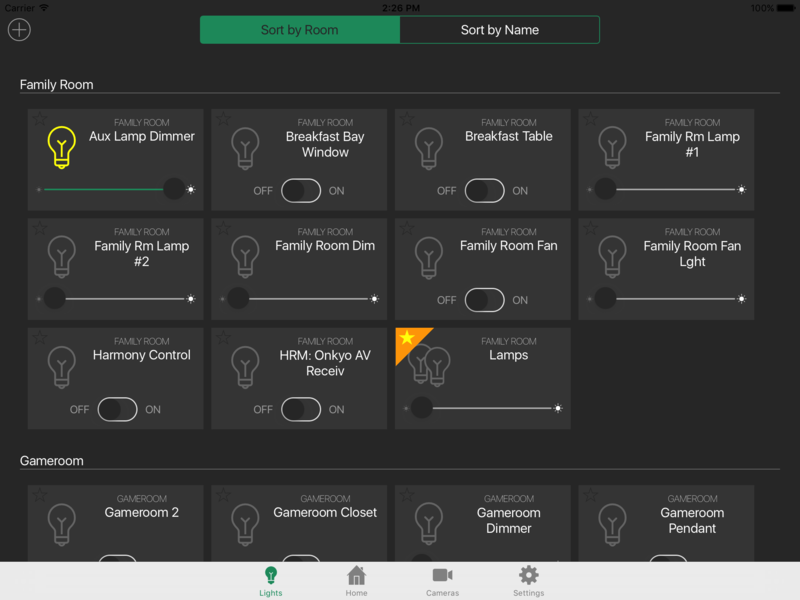 As the name implies, a "group switch" combines smart switches and dimmers to make it easy to control multiple devices with a single action. Similar results can be achieved with "scenes" or "programs," but a group switch is easier to setup and allows for ad-hoc control of the grouped devices. Group switches are treated like any other device in Invisible: Controller. They show-up on the "Lights" tab in the app, and they can be marked as a "Favorite" device to make them show-up on the "Favorite Devices" dashboard widget. 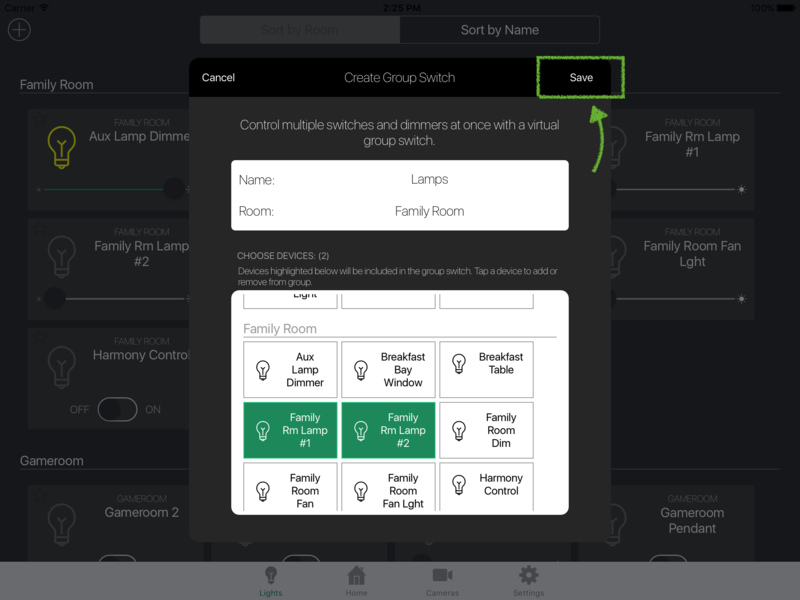 Visually, a group switch can be identified by an icon showing multiple overlapping light bulbs (whereas a standard, "non-grouped" switch is just displayed with a single light bulb icon). 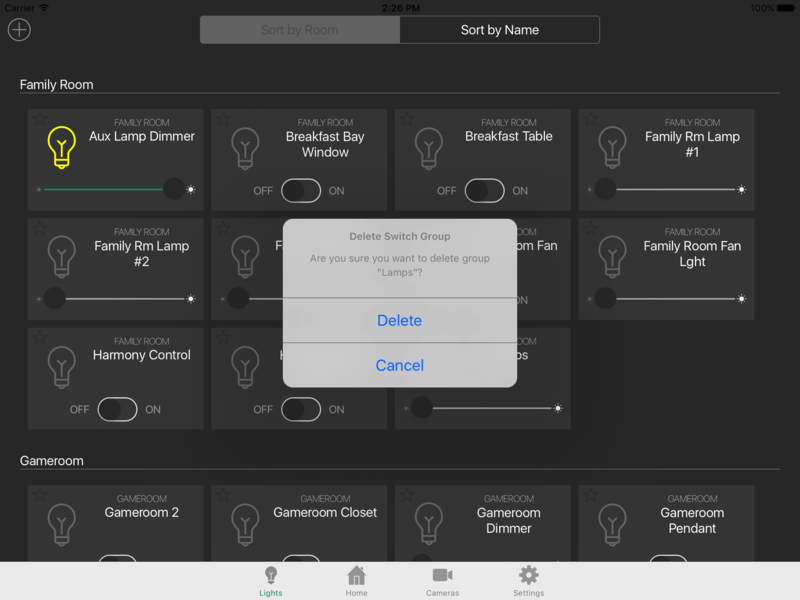 If a group switch contains any dimmers, the control for that group will show the dimmer slider. On/off switches in a group with dimmers will ignore any dimming commands, and will only be affected when the group is turned all the way off or all the way on. The current dimmed level of a group will reflect the dimmer level of the brightest dimmer in the group. 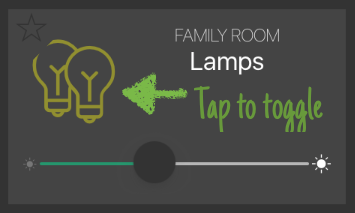 As with other switches in Invisible: Controller, tapping the lightbulb icon for a group will save the current dimmer settings and turn all lights off. Tapping the icon again will restore the lights to their saved settings. 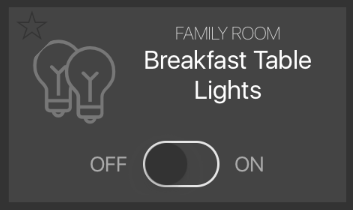 If a group does not contain any dimmers, the control for that group will show the On/Off toggle switch. 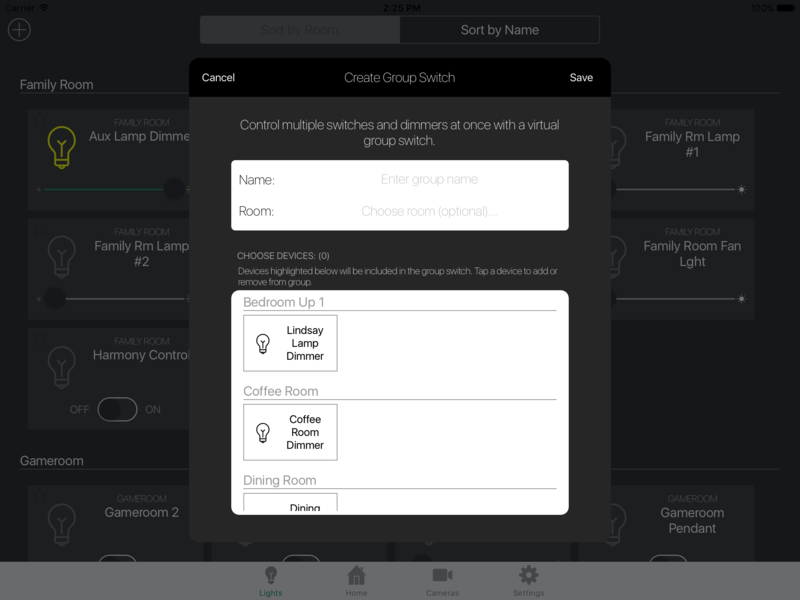 NOTE: Group switches are created within Invisible: Controller, not on the smart home hub. To use a group switch, you must use Invisible: Controller. 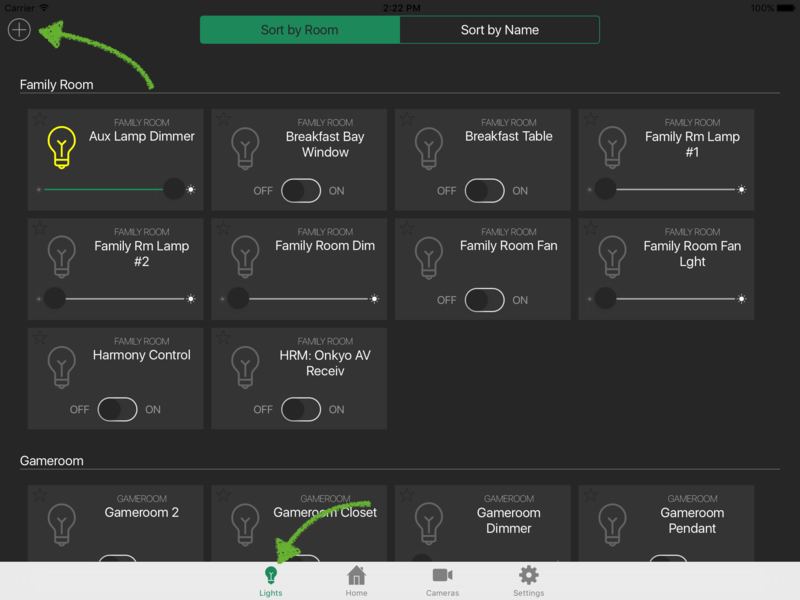 To create a group switch, start by navigating to the "Lights" tab in Invisible: Controller. In the top left corner, tap the "+" icon to open the "Create Group Switch" window. A group must have a name and at least two switches. When you're done, tap "Save" to save the new switch. TIP: If you're using multiple tablets, Invisible: Controller Cloud Sync will automatically synchronize group switch settings between devices. To make a group switch appear on the Invisible: Controller dashboard, simply mark the device as a "favorite." Any group marked as a favorite will appear in the "Favorite Devices" dashboard widget along with any other saved favorite devices. Simply navigate to the "Lights" view and find the group that should be on the dashboard. Tap on the star in the upper left corner of the group tile to make it a favorite. 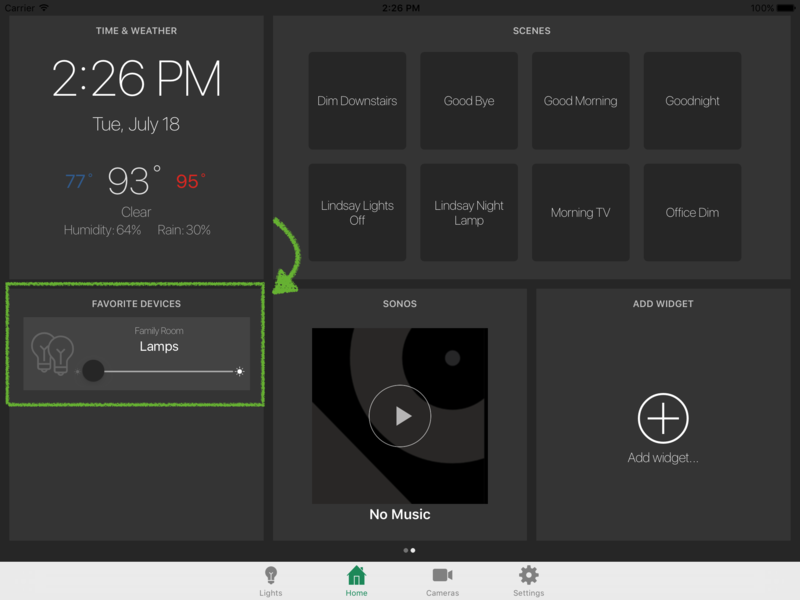 Navigate back to the dashboard ("Home") tab and the group will now be displayed in the "Favorite Devices" widget. To remove the group, simply reverse the process to "un-favorite" the group on the "Lights" tab. A group switch cannot be edited at this time. Instead, to make changes to a group switch, or to permanently remove it, a group must be deleted. To delete a group switch, first navigate to the "Lights" tab in the Invisible: Controller app. In the list of devices, find the group switch that will be deleted. Once located, tap and hold (aka "long press") the name of the group. After a short delay, a message will pop-up confirming that the group should be deleted. Tap "Delete" to complete the action. NOTE: If you are using Cloud Sync, deleting a group on one device will remove it from all devices using the same Invisible: Controller account.